Algeria, Andora, Antigua and Barbuda, Bahrain, Bangladesh, Barbados, Belize, Benin, Belarus, Bolivia, Bosnia and Herzegovina, Brunei, Bulgaria, Burkina Faso, Cape Verde, Central African Republic, Djibouti, Cambodia, Cameroon, Chad, China, Comoros, Congo, Croatia, Cuba, Democratic Republic of Congo, Dominica, Egypt, Equatorial Eritrea, Estonia, Ethiopia, Finland, French Guiana, Gabon, Gambia, Ghana, Greece, Guinea, Guinea Bissau, Grenada, Guyana, Georgia, Haiti, Hungary, Indonesia, Iraq, Iran, Israel, Ivory Coast, Jamaica, Jordan, Kazakhstan, Kosovo, Kuwait, Laos, Latvia, Liberia, Libya, Lithuania, Lebanon, Madagascar, Macedonia, Malawi, Mali, Marshall Islands, Mauritania, Mexico, Montenegro, Mongolia, Morocco, Niger, Nigeria, North Korea, Oman, Palau, Palestine, Poland, Qatar, Romania, Russia, Saint Kitts and Nevis, Saint Lucia, Saudi Arabia, Sao Tome and Principe, Senegal, Serbia, Sierra Leone, Slovakia, Slovenia, Somalia, Sudan, Suriname, Syria, St. Vincent and the Grenadines, Taiwan, Togo, Trinidad and Tobago, Tunisia, Turkish Republic of Northern Cyprus, United Arab Emirates, Uzbekistan, Venezuela, Yemen postgraduate applications will be received in the second round between 5 February – 5 March 2018; while undergraduate applications will be received in the third round between 16 April – 27 May 2018. Türkiye Scholarships students can stay in public university dormitories without paying any fees. Students who do not wish to stay in these dormitories can opt for other housing options on their own expenses. Türkiye Scholarships students’ health expenses are covered by public health insurance. Türkiye Scholarships Students are subject to a Turkish language course for one year if they do not have proof of Turkish Language proficiency. Turkiye Scholarships students who will study a program in other languages instead of Turkish are also required to take the Turkish Language Course. Turkish Scholarship students are provided with a once time ticket for their first arrival in Turkey and for their departure after completing their study. If the student purchases the ticket, the amount will be reimbursed later on. 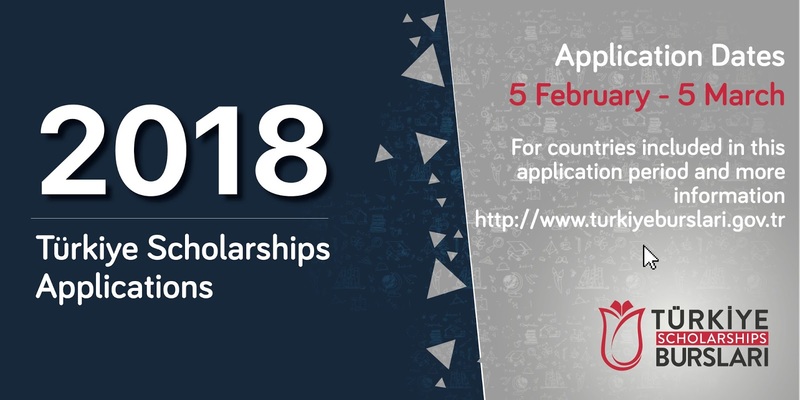 How to Apply for Turkey Scholarships. Applications are to be made online.. Candidates are required to submit/upload all the required information and/or documents through the application system. Apply Before: 5 March 2018.